Audie signals for Brandon to remain where he is, but he may as well have been directing the wind. As Audie covers him, Brandon jerks the pin from a grenade, and hurls it. Five Germans are dead. Brandon yells, “Jesus!” and Audie can’t tell whether the word is meant as an oath or a prayer. They carry Steiner’s body to the highway where it will be easily found. He could not have lived long after tumbling. The bullet ripped an artery in his throat. 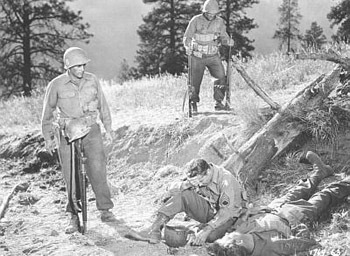 According to David “Spec” McClure, a soldier who was in the war with Audie and helped him write his autobiography, To Hell and Back, “Audie was ruthless in combat, but he could not kill men who had no chance to defend themselves. One day, the enemy sent a combat patrol of seven soldiers to seek them out. Before they could reach the quarry, Audie ordered his machine gunner, an Indian named Jim Fife, to stop them. On March 2, 1944, Audie volunteered to lead a seven-man patrol in an attempt to further wreck an enemy tank. He was completely aware that the Germans would likely be on guard. Leaving his men under cover, he moved 100 yards up to the vicinity of the tank. Two Molotov cocktails that he hurled failed to ignite. He threw a hand grenade through the tank hatch. The explosion did not even extinguish a light that had been left burning inside. The Germans discovered Murphy and started firing. With bullets whipping around him, he hastily set up a launcher and blasted the treads off one side of the tank with rifle grenades. He then escaped unwounded in a hail of enemy fire. The tank was never retrieved by the Germans. For putting it permanently out of commission, Audie received his first medal, The Bronze Star. Then came the worst day of Audie’s young life—the day he realized that the fight for freedom came with the ultimate price, and there was a place called Hell right here on earth. “I told my men I was going to crawl ahead of the platoon and see what I could do about the invasion. ‘I’m going too,’ Pfc. Lattie Tipton, 33, of Erwin, Tenn., said. “That day Tipton had been shot through the left ear and was bleeding a lot. But when I ordered him back to the beach for medical treatment, he refused. I knew he wouldn’t pay any attention if I told him to stay with the platoon now. I should have made him stay. They crawled out of the ditch and inched their way 75 yards up the side of the hill. There they secured another ditch and set up a machine gun. As they got the ammo ready, the Germans quit shooting, and they saw a white flag waving at the top of the ridge. “This looks funny,” Lattie said, “but I’m going up and get them. Keep me covered.” Audie said Lattie crawled out of the ditch and stood up. There was a burst of machine gun fire, and Lattie fell back in the ditch on top of him. Audie continued to move over the hill, his machine gun boring into everything that moved. Resistance soon ceased. He walked to the edge of the forest and waved Company B forward. With the strong point neutralized, Audie went back and dragged Tipton out of the foxhole. For the first time in the war, he made his best friend a pillow for his head, took a last look at the photograph of Tipton’s daughter, Claudean. Then he sat down and cried like the child he really was. His action was to bring him The Distinguished Service Cross. “The crosses grow on Anzio, where hell is six feet deep,” Audie Murphy wrote in 1946. He’s just saying . . .
To be continued . . .This is part eleven of a continuing series on Audie Murphy, born in Kingston, Texas, reared in Celeste, who grew up to become the most decorated soldier of World War II.